With paddock access included with all tickets this weekend, the Pirelli Qatar Round is truly one for all and children under 11 have access for free, making it a full family affair. With the pressure off for the championship, there is still all to play for on track and so much to see off the track throughout the Pirelli Qatar Round. With a welcoming Arabic tent in the paddock, fans will be able to chill out and relax throughout the day, in-between or before sessions out on track. Offering an opposite vibe compared to the sensational action out on track. Whilst you can enjoy many delicacies with the food court which is filled with an array of favourites, as you proudly wear your new merchandise which can be purchased from the tents. On top of this, children can enjoy an alternative look around the paddock with the pedal cars. But the main attraction of the weekend will no doubt be the Paddock Show. Unique to WorldSBK, live commentary begins on stage from Thursday, with every session live on stage from FP1 at 16.20 LT right through to 21.25 LT for WorldSBK FP3. Friday brings even more action to the stage, with A Question of Bikes beginning at 15.25 before the new for 2019 WorldSBK Podium Show directly after Race One. See your heroes on stage straight after the Podium, getting their first reactions. 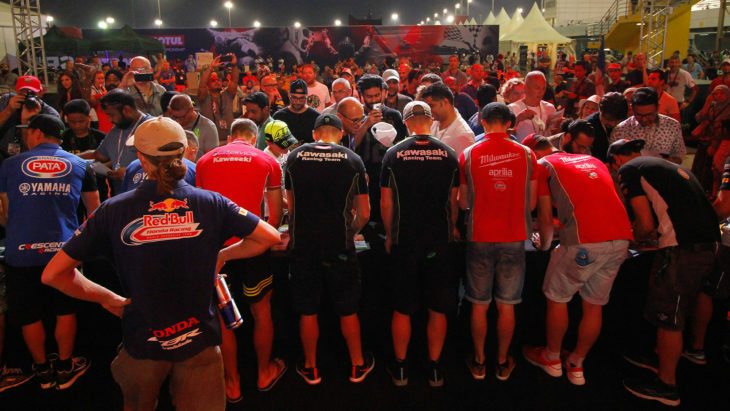 Action then begins to heat up on stage on Friday night with the SuperShow beginning at 20.45, as all riders will be present to give fans the full SBK® experience and meet all your heroes. Ending the weekend on Saturday, the on stage action starts from 16.30 right through to the extended time of 21.45. With interactive games, the two podium shows there is also another exciting addition. The World Champions prize giving show begins at 21.00, as fans, teams, riders and members of the paddock have the opportunity to congratulate our 2018 world champions on stage, followed by a cocktail. All three day tickets include a free invitation to the prize giving show, so everyone can be involved. On top of this, the MOTUL Action Box will be open all weekend in pit garage 31 for fans to enjoy a different aspect of the racing from, getting right into the heart of pit lane. Or get another aspect of pit lane with the pit walk, on Friday at 15.30 or Saturday at 16.00.